In the Year of Our Death, the sequel to After the Bite and In the Lone and Level Sands is now available in print and eBook formats at various retailers, and should go live at several more over the next few hours. It’s been two years since the zombies first appeared and changed the world forever. Keely and her friends escaped the hell of Seattle and settled down near an abandoned radio station. Bailey finds herself caught up with a ravenous group of survivors. Georgie has set up a courier system to move mail across the remains of America. Will and his friends—all of them orphans now—are out of water and have to leave their quiet suburb for the first time in their lives. Nelson, the engineer charged with running Hoover Dam and powering the American Southwest, breaks his glasses and must wander the wasteland nearly blind looking for a replacement. Adam, however, knows the truth about the zombies: They aren’t monsters, they’re angels, sent by God to cleanse the world of the survivors, and Adam and his Church of Lesser Humans were put here to help them do it. Armed only with faith, a bus, and the steadfast rule to never allow harm to come to the zombies, Adam knows Judgment Day is coming, and will stop at nothing to herald its arrival. You can read a sample chapter here as well as download samples from the retailer of your choice. The paperback edition should be available through Amazon’s website and Barnes & Noble’s website soon. Also available is the collected edition, Zombiemandias: In the Zombie Apocalypse Collection, an eBook that includes After the Bite, In the Lone and Level Sands, and In the Year of Our Death. Thanks to everyone who makes what I do possible. This includes you, the reader, without whom I’m just sitting here shouting random nonsense into a void. Thank you. I recently received my proof copies of the hardcover editions of After the Bite and In the Lone and Level Sands. I’m pretty happy with the way they turned out, and now I’m making them available to purchase through Lulu. I wish I could make these available elsewhere, but I can’t justify the cost to do so. For now, Lulu is the only place to get hardcovers of these books. Paperbacks and ebooks will remain available everywhere they currently are. After the Bite comes in black satin with gold spine text, while In the Lone and Level Sands comes in tan satin with black spine text. Both books feature glossy dust jackets and black-and-white interiors. In the Lone and Level Sands comes out Tuesday, November 26th. You can pre-order the ebook through Smashwords, Barnes & Noble, and iTunes. The ebook will also be available through Amazon, Kobo, and Sony eBooks. A print edition will also be available soon. Purchasing a new print edition through Amazon will allow you to download the Kindle eBook free of charge. Just a reminder, you can read the first 19 chapters of the book under the “Samples” section of this blog. You can read a longer sample at the book’s Smashwords page. Another reminder, the ebook edition of After the Bite is free for the month of November. I’m very excited to release this novel next week. In the meantime, my NaNoWriMo progress has slowed considerably. I reached a point where it felt like forcing the story out would ruin it, so I’m more or less checking out of NaNoWriMo. I wrote a good 20,000 words and I absolutely plan to finish this novel, just not by the end of November. I’ve also come up with a new title for one of the books I’m querying agents for. I’m not sure whether I want to change it yet, but I’m thinking I’ll do a blog post about titles pretty soon, as I have a few things to say on the subject. The tentative release date for my co-authored zombie apocalypse novel In the Lone and Level Sands is November 26th, 2013. Leading up to its release, I’ve been posting a lot of fun zombie-related stuff on the book’s Facebook page. This blog post is meant to recap a lot of that. If you like zombie fiction, I hope you’ll check these out. Free Norman Peters! – A blog maintained by one of the minor characters in In the Lone and Level Sands. After the Bite – A collection of short stories and poems set during the same zombie apocalypse. Published in 2012, the e-book is free for the month of November if you download it through Smashwords, Barnes & Noble, Kobo, iTunes Books, or Sony. Update: Amazon now also allows you to download the eBook free of charge. This book is also enrolled in the Kindle Matchbook program, meaning if you buy a new copy of the paperback edition through Amazon, you can download the Kindle version free of charge. In the Lone and Level Sands preview – The first two parts (about 16%) of In the Lone and Level Sands uploaded as a .doc to Google Docs for easy reading. This includes the first 19 chapters of the upcoming book, in their entirety. I’ve been a huge fan of zombies for a long time, and In the Lone and Level Sands is the zombie epic I always wanted to write. I’m happy to finally be releasing my contribution to the zombie genre, and I hope you’ll stick around when it arrives later this month. I also hope you enjoy the rest of this stuff in the meantime. Have fun! Hey guys, I put a new page up on my blog. It’s a sub-page of the Published Works section, or you can click this link. The page contains the entirety of my short story “The River” from the collection After the Bite. If you like what you see, there’s a longer preview featuring a few more stories on the book’s Smashwords page. If zombies aren’t your thing, feel free to share the page with anyone you think might be interested. I’d be eternally grateful to you. Thanks for everything, and take care! After the Bite by David Lovato and Seth Thomas. Cover art by Laura Soret. This is that big announcement I’ve been talking about. 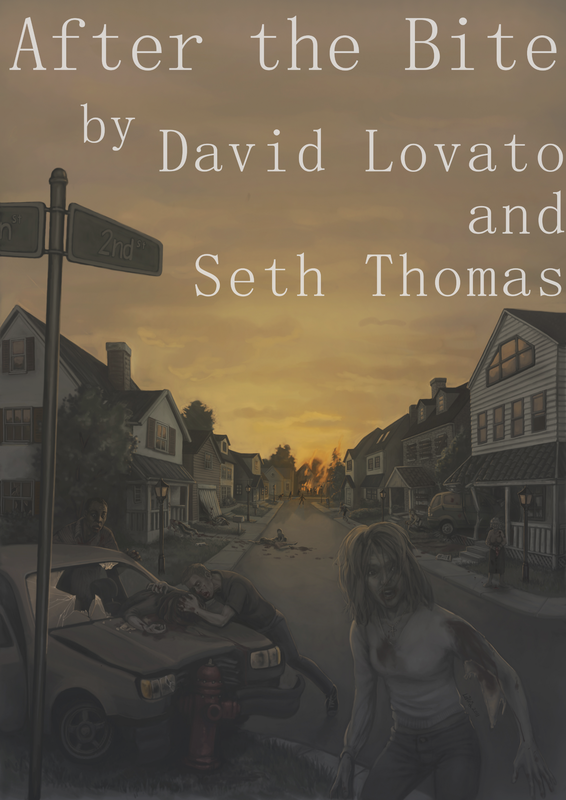 My friend Seth Thomas and I have written a collection of short stories about zombies, and we’re self-publishing it. It’s called After the Bite. We’ve been working on this for a while. We actually wrote a book, and these are stories set in the same universe, but they stand on their own. You can buy After the Bite on Smashwords for $4.99. It should be available through other retailers (like Barnes and Noble, Amazon, Apple iBooks and more) in the coming weeks. We’re also looking at a print edition. If you’re at all interested in zombie fiction, it’d mean a lot to us if you picked up a copy of our book. The first few stories are available as a free preview on Smashwords, and I’ve decided to write up a brief summary of each of the stories so you’re not going in blind. If zombies aren’t your thing (and even if they are), you’ll forever be awesome to me if you pass this link around to your friends and family. Thanks again to everyone who has followed Seth and I, our blogs, our facebook pages, our lives in general. You mean the world to us. If you decide to get a copy, it’d also mean a lot if you left us a review on Smashwords or Goodreads or wherever. Every little bit helps us out, and we appreciate it so much. 1. The River – Jack and Henry are brothers and best friends, but the world threatens to pull them apart. The zombies aren’t helping, either. 2. 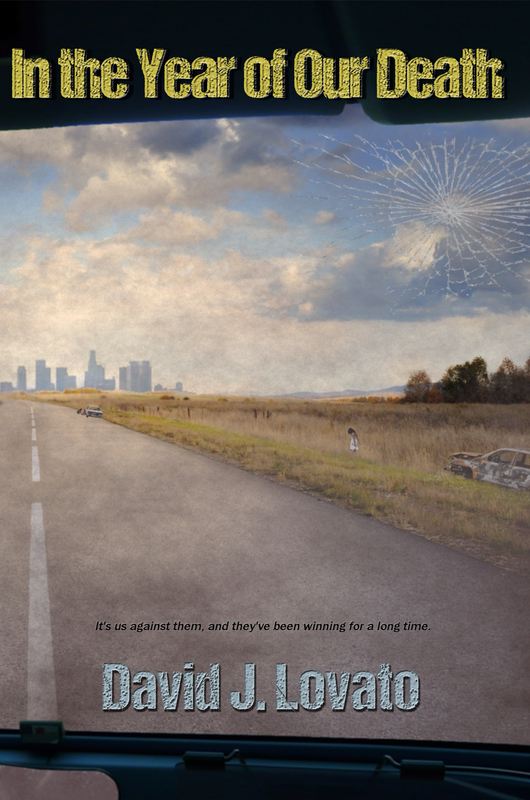 On the Road – Larry embarks on a survival road trip across a post-apocalyptic America. 3. Holy War – A Jewish man and his Muslim neighbor meet daily in a battle of words. 4. The Living Dead – A brief glimpse of what it means to one man to be alive. 5. On 68th and Woodland Drive – A short poem about the zombie apocalypse. 6. Tragedy in Belford – A successful writer pens the moments leading up to the zombie apocalypse. 7. Sanctuary – A man named Garrett is looking for safety, like a lot of people. Finding none, he decides to make it himself. 8. Death’s Robe – A portrait of the zombie apocalypse. 9. Grampa’s War Story – A group of soldiers on a secret mission in the Middle East must battle enemy combatants and zombies alike. 10. Concrete Nightmare – It’s just another day on the job, until people start eating each other. 11. Dead and Gone – A poem written on a blood-stained scrap of paper. 12. Acceptance – Sometimes it’s hard to share our secrets, even with those we love. 13. Alone Up There – The crew aboard the International Space Station find themselves adrift in a sea of stars. 14. Dog’s Story – The zombie apocalypse isn’t limited to human beings. 15. Thy Neighbor – Two men whose families have been at it for generations might be each other’s only hope. 16. Grim is the Truth – The diary of one survivor of the zombie apocalypse. 17. Two Worlds – When zombies run him out of his home, a young Mexican man heads across the border into America, looking for his brothers. 18. Did Your Mama Ever Tell You the Story of the Day You Were Born? – Everyone has a baby story. Caleb’s involves zombies. 19. BAZK – These guys just want to be rock stars, but zombies keep getting in their way. 20. Like Fish – Brent struggles to hold on to his humanity when the world takes everything away. 21. Ghost Story – When the world is long gone, what happens to those left over?